Aside from Hidilyn Diaz who was hailed as the first Pinay athlete who won a silver medal in the 2016 Rio Olympics in the weightlifting category, another athlete who captivated the attention of the viewers worldwide and instantly trended on the internet was the Tongan taekwondo athlete Pita Taufatofua. During the opening ceremony of the most-talked about Olympics games, Pita was the flag-bearer of their country. 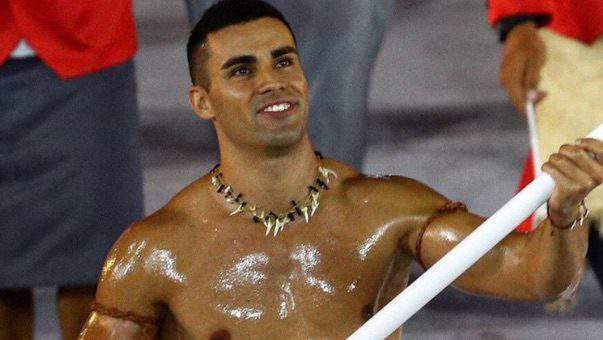 He carried their flag shirtless and his body was all greased-up making him so hot on the game's commencement. This appearance made him an instant celebrity during that day and fans really want to give him a gold Olympic medal for that oozing look. Pita is a 32-year old athlete. Aside from his captivating look in the Olympics, he also break another record for being the first ever Tongan athlete to qualify in the Olympics for taekwondo. On his interview conducted by TODAY News (www.today.com), Pita revealed that he decided immediately after finding out he would be Tonga's flag-bearer that he would wear traditional Tongan dress instead of the usual team uniform at the opening ceremony. Yes the one he's wearing was their tradition dress. "For us it was important to get our culture out to the world. I said to them I want to march in what our ancestors wore 200 years ago and this is what it was." *Photo Courtesy of TODAY News. Pita further revealed that the oil in his bare-chested upper body was a coconut oil. Pita's look in the said Olympics already received million appreciations from the netizens worldwide. Celebrities also praised the artistic hot look of Pita and even shared his photo on their Instagram accounts and tweet their comments about this hot guy.